Enjoy Your 2016 Lake George Summer Vacation at Antigua Resort! 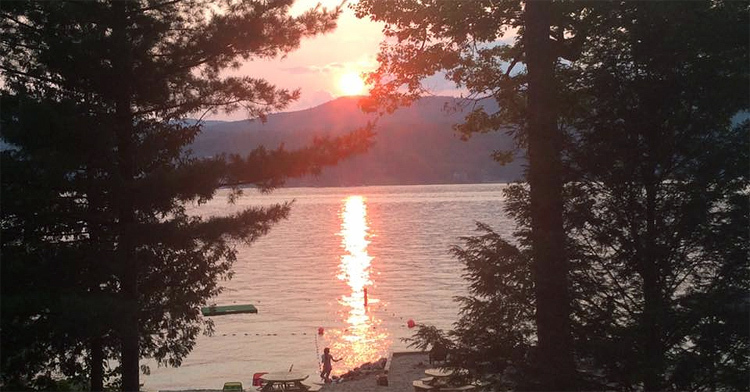 Spend the Dog Days of Summer in August at Antigua Resort in Lake George! This entry was posted on July 23, 2018 . This entry was posted on May 29, 2018 . You’ve been planning your Lake George vacation, probably know that so much to see and do here it’s difficult to know where to begin! Here at Antigua resort on Lake George, vacations are all about rest, relaxation, family and fun! We look forward to meeting our guests each year, catching up with old friends and meeting new ones. 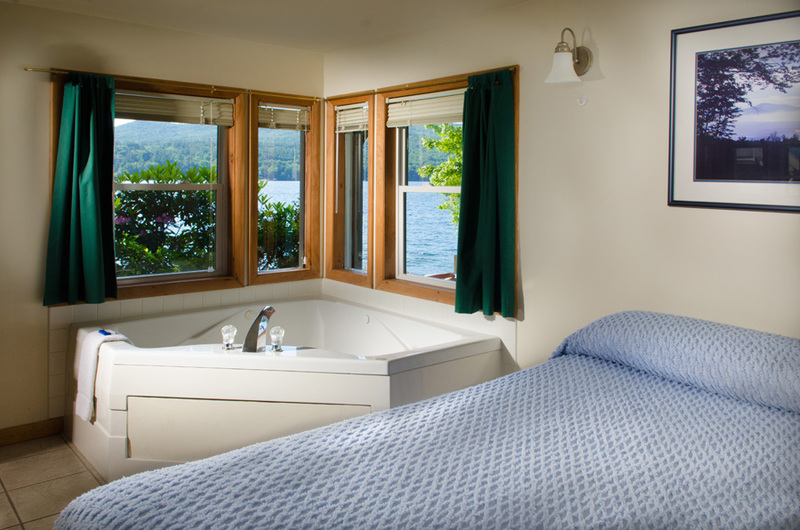 We truly are on “the quiet side of Lake George”, nestled on the east shore where the sunsets are breathtaking, the views are gorgeous, and the accommodations perfect. The resort has been owned by the Brown family since 1973. (You can learn more about the history of the resort and how it got its name here.) 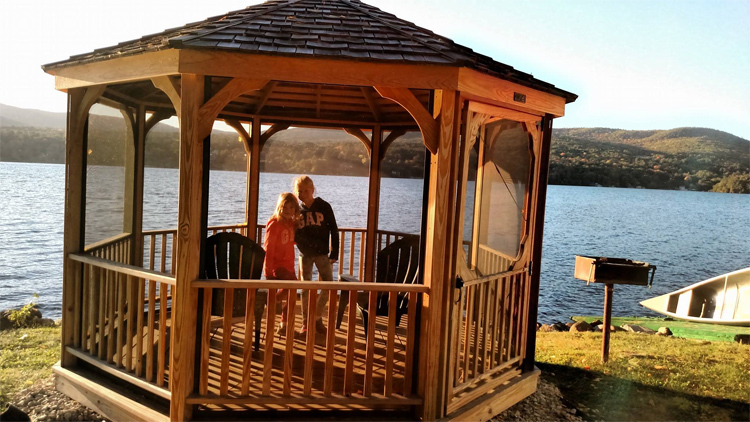 One of the reasons we are so family-friendly; there is a walking path around the entire property that gives access to the playground, recreation area, boat docks, barbecue pavilion and the gazebo at the lakeshore. Check-in is right in the main lodge, where you will be greeted by the Brown family, and given everything you need to get comfortable. Questions are always welcome, and we can provide information on local dining, events, etc. Swimming: What is summer vacation without playing in the water? Our sandy beach provides the perfect setting for families to relax and enjoy the water. The little ones can play in the sand at the water’s edge, and there is a swim raft providing endless hours of fun for the older ones. Dock fishing: If you have experienced this, you know how much fun it is. If you have never done this, you’re in for a treat. Sitting on the dock teaching your kids to fish, Listening to the waves and enjoying the view, whether you catch a whopper or just end up drowning a worm, is the quintessential summer vacation experience. Grillin’ and Chillin’: our BBQ pavilion provides easy access for guests to grill, with picnic tables overlooking the lake and close to the playground area. Campfire Nights: What is summer vacation without a campfire and s’mores? But like everything else at Antigua Resort, your campfire experience includes beautiful lake views and a memorable family experience. On Monday and Thursday nights in July and August there’s live entertainment at the campfire. 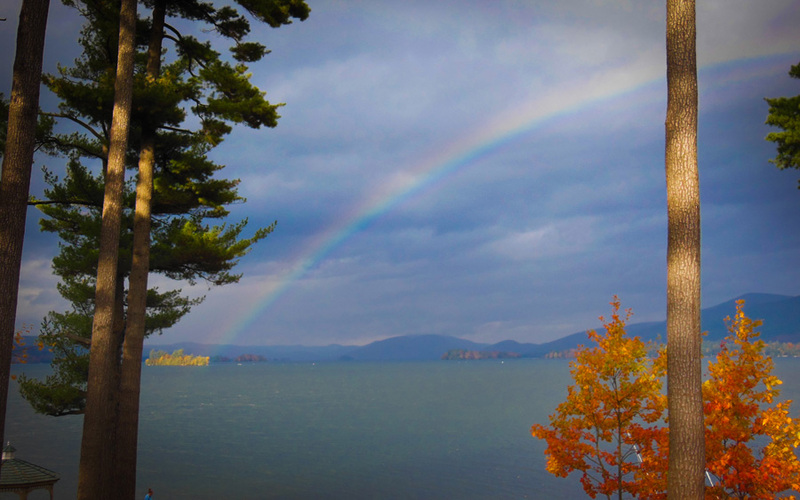 Annual Events: No matter when you come to visit, your Lake George vacation will probably include enjoying one of many annual events. From the renowned Elvis Festival (there are Elvis’ everywhere!) , to the amazing spectacle that is Americade, to the lake George Music Festival or the Adirondack nationals car show, these events offer something for every member of the family. Lake Cruises: THe Queen of American Lakes is 32 miles long, with crystal clear water and dozens of islands. The best way to take it all in is with a cruise from the Lake George basin north. 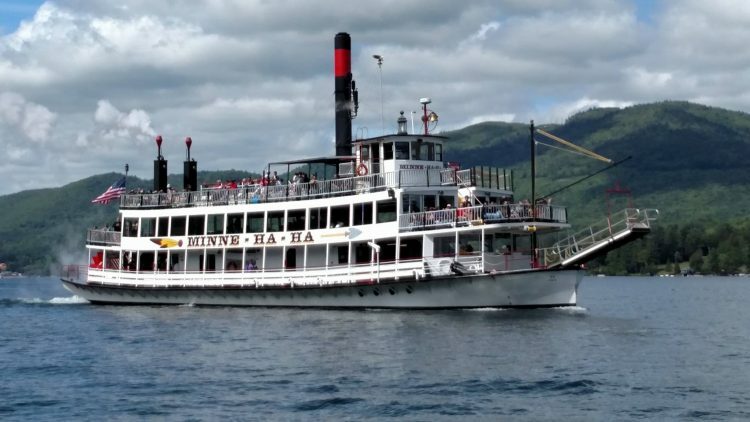 THe Lake George Steamboat Company has a full complement of scenic cruises. You can also enjoy a Lake George Island Boat Tour or – wait for it – a Tiki Tour! History: Lake George and Adirondack region is filled with rich history. Right here you can visit Fort William Henry, or take a day trip north to experience Revolutionary War history at Fort Ticonderoga or the Sembrich Opera Museum in Bolton Landing. Amusements: Find lots of family fun parks like Six Flags Great Escape, arcades, water parks and goony golf! Lake George region is home to all sorts of fun, whether your preference is roller coasters, wave pools, or games (learn more here)! Shopping: The nearby shopping area known as the “million dollar half-mile” includes Lake George Factory Outlets, with dozens of designer name factory outlets. Browse Lake George’s Canada St., where you will find unique boutiques and stores. Sightseeing – Our region is one of the most beautiful in the Northeast when it comes to sightseeing. Take a ride to the top of Prospect Mountain Lake George, drive north on Route 9N along the shore of Lake George to Ticonderoga, and back along Rte. 74. Hiking: Hm…where to start here? Try Buck Mt., Sleeping Beauty mountain, Pilot Knob, Shelving Rock Falls, all different difficulty levels but all offering gorgeous views! Biking: In addition to scenic highways and byways, we have great biking trails including the Warren County Bikeway and Feeder Canal Trails. Be sure to check the Queensbury Recreation Department mountain biking trail list. Parks and Picnics: What is summer vacation without a picnic? Check out Shepherd Park right in Lake George Village, Lake George Battlefield Park, and a host of other parks nearby. Water fun: The Adirondacks are the land of Lakes! If you’re ready to try some adventure, how about trying your hand at parasailing, waterskiing, diving, or charter fishing? Browse our photo gallery for images of Antigua Resort at Plum Point. Check our availability online and request a reservation or call Antigua at 518-668-2556 for more information on our beautiful Lake George NY resort! Antigua Resort is also one of the few East Shore Lake George resorts with boat docking available for our guests. Check availability, request your reservation online or call (518) 668-2556 today to book your summer getaway and learn more about how to get the most from your Lake George vacation at Antigua Resort!